Okay, let me open this with, I don’t cook. Like, seriously? I just don’t do it. I used to cook healthy stuff when I was bodybuilding in my 20s. But now, I want simple, easy and quick. So, this is not really a cooking post and you won’t see me sharing recipes often … unless I come across something involving very few ingredients and very little actual cooking. That being said, I didn’t really cook today. 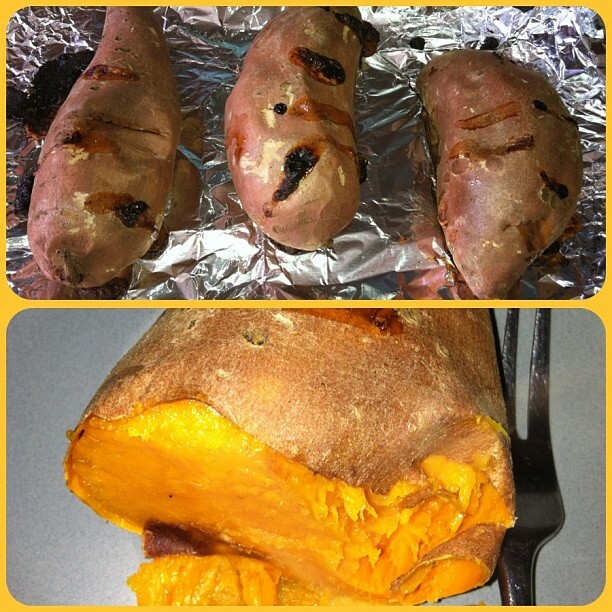 But, I did bake a few organic sweet potatoes to serve as meal additions and snacks for the week. You see, baby when I used to bodybuild, this was a mainstay of my diet. Sweet potatoes are full of fiber, nutrient rich (Vitamin A, C, potassium, beta-carotene, etc. ), and a great addition to many meals (a medium-sized one counts as a serving of veggies). The best thing of all? When I’m watching calories and sugar, sweet potatoes, which have a low glycemic index (surprise!! ), sooth my sweet tooth and are a satisfying dessert!! Want to learn more about the health benefits of sweet potatoes? Check out this post on LiveStrong.com: The Health Benefits of Sweet Potatoes. Anywho, prior to going to yoga this morning, I rinsed and scrubbed the organic sweet potatoes (organic is preferred) and left them on a paper towel on the countertop to dry. When I got home, I simply pierced each sweet potato with the fork a few times and baked in a 450 degree oven (on aluminum foil in middle rack) for about an hour while I took a nap (don’t worry, Wei was awake )!! I ate half of one, skin and all, when I awoke! Delicious!! 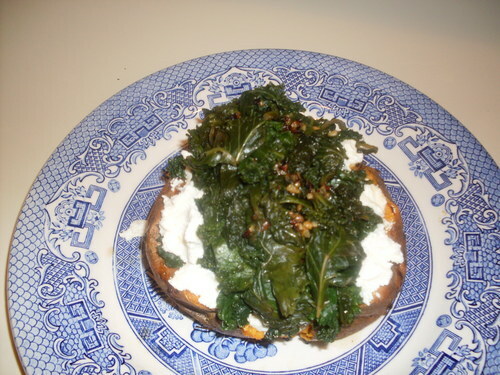 Since I was thinking about sweet potatoes, I figured I’d share a simple and healthy, sweet potato with kale and ricotta cheese recipe that a friend shared with me a couple of years ago!! The ingredient list is short and sweet, just like I like it! This is when I made it about 2 years ago!! LOL!! Guess it’s time to try again. I think I’d like to try this with spinach too! And, I read another recipe that suggested slicing them after baking and sautéing in coconut oil with sea salt!! Mmmmm … simple and easy!! Are you a fan of sweet potatoes? What’s your favorite way to eat them? I absolutely love baked potato with a little smart balance buttery spread. No need for anything else. Marsha, I soooooo was thinking about putting some Smart Balance spread on this potato!! I always have it in the fridge!! But, I decided to just eat it plain as I’d had some gluten free snack mix earlier in the day and it had nuts/fat. But yeah, that is delicious!! LOL I don’t cook either. I’ve been eating sweet potatoes too. Its part of the SHRED diet. Yes I am! I like baked sweet potatoes with a bit of butter, and brown sugar sprinkled on top. LOL!!!! Rhonda, you are too funny!!! I’m going to make baked sweet potato fries one day too! And all that sounds delish and easy!! Just like me likey ;)!! That is soooo funny! I purchased some steam in bag cubed, organic, non-GMO sweet potatoes a few weeks ago and made some tonight! I didn’t steam the all the way done, instead I tossed them in olive oil, herbs de provence, salt, pepper, garlic salt and put them into the oven at 450 for about 45-60 minutes! The sweet/savory of it all made it hit my starch spot and my sweet spot! LOL! i just made this and it is so incredibly good. i made a cashew “cheese” and substituted that for the ricotta. delicious. thank you!